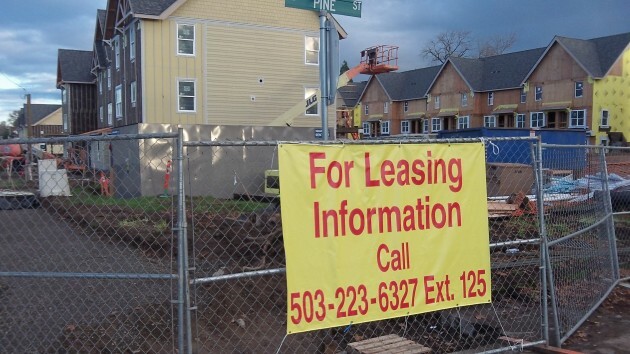 Woodland Square is beginning to look for tenants, as the sign indicates, but by the time the first ones move in early next year, this brand new Albany apartment complex will likely have a different name. The $10.6 million project at Pine Street and Salem Avenue has been going by “Woodland Square” because it replaces a rundown trailer park by that name. Now the developer, Innovative Housing Inc. of Portland, wants to shed any connection with that former blight on the neighborhood. With that in mind, IHI is launching a public competition to come up with a new name. “People can submit names to me via email until Dec. 25,” says Garver, whose address is jgarver@innovativehousinginc.com. The company’s executive director will pick the new name, and the winner will receive $200. But wasn’t “Woodland Square” a fitting name for the site? After all, it was heavily wooded even though the trailers were not much to look at. And didn’t IHI say it wanted to replace many of the stately trees cut down to make room for the buildings? I’ll ask the same questions that were asked, and went unanswered, about the Edgewater Village project. And what is the expected tax increment receipt for the Woodland Square project? As to your first question, I’m not exactly sure what you’re looking for–the total increase in property value in the CARA district? If so, I can get that information to you. As to the second question, even though IHI is a non-profit, there is an anticipated increase in the property tax on this project (in addition, of course, to the other merits of the project including: significant blight removal, crime issues at the old mobile-home park, creation of 54-units of much needed workforce housing, and the construction jobs.) This project is anticipated to yield $25,000 per year in new property tax. If you’d like more details, feel free to email me. The big issue Kate is how much is it going to cost in city resources to service those units? Getting rid of the trailer park is a no brainer but $25,000 for 54 units of low income housing is not going to cut it. Not complaining as the area is getting cleaned up but as far as making money, it’s going to be a loser for the city. High density, low income, residential real estate takes a lot of money to run, that’s just the reality of the situation. I bet you’ll need at least two additional full time officers or places like N. Albany will just have a smaller police presence. I was going to make a joke and say let’s call it Cabrini-Green West but then I thought it was probably in rather bad taste.